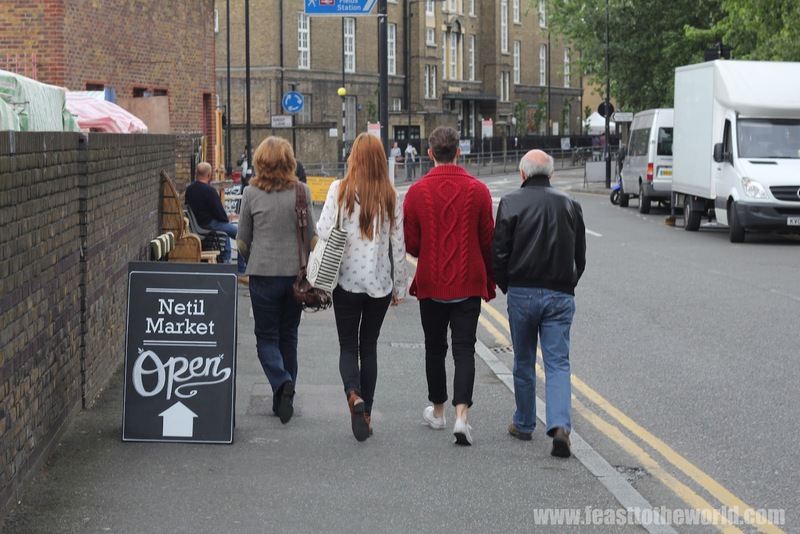 Last Saturday, after making my way to my current favourite Maltby Street market down in Bermonsey for some delicious custard doughnuts (Yes! That DOUGHNUT from St. John bakery, I bought 4 of them!) I happen to stumbled upon a tweet from Netil Market talking about the chicken satay that were on offered. Now, being a bonafide Singaporean, how can I resist getting my Asian paws on those models and give them a go. So despite of the tedious journey - not easy nor convenient to get from Bermondsey to Hackney as it would seemed - I was determine to make my way down to this market place. So over an hour later, I found myself approaching the Netil market. 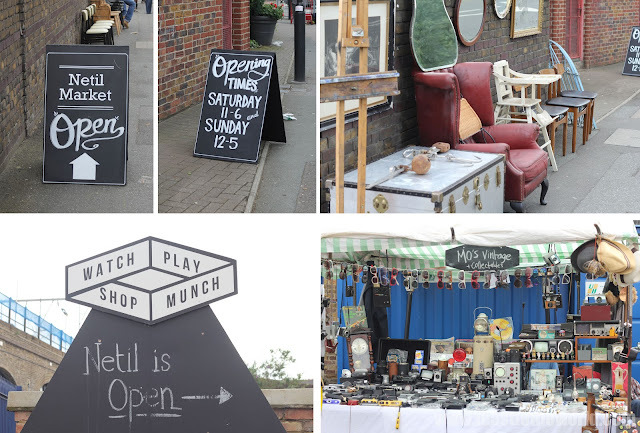 Situated just off London's field in a car park and only a stone throw away from the more established Broadway market is this one-year-old pop up Saturday market. Only recently did it also decided to open on Sunday too. This is not just food market as it turned out as I had previously thought, there were lots of eclectic mix of vintage home wares, crafts, clothing, camera and even a bicycle shop that will fix your bike up for you as you wondering around this quaint little venue. But of course, my priority was to head straight to the Kamchi stall. Set up by the amiable Daniel and Emma, both extremely passionate foodies like myself who had previously been resided in Thailand for a couple of years. Being huge fan of Southeast Asian street food themselves, they've decided to start up their own little venture serving just that. 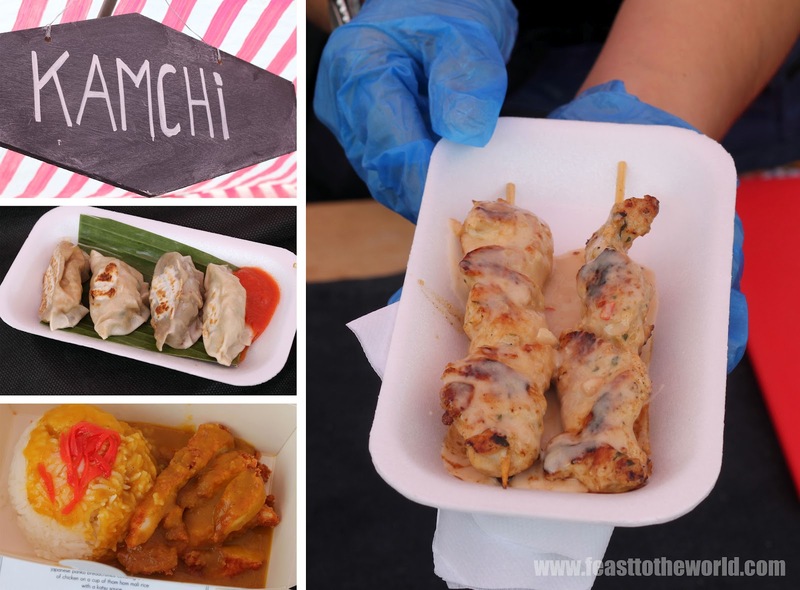 Asian delights with fresh and quality ingredients such as Japanese Katsu curry with their own homemade curry sauce, using free-range chicken from their trusted farmer, as well as morsels of tasty Gyoza. These received positive compliments from the customers while I was there chatting to the pair about Singapore hawker food and Char Kway Teow and everything in-between (food generally). And not forgetting the chicken Satay which the pair kindly offered me to try. The chicken have been marinated on lot of lemongrass, coriander etc and were well flavoured. The sauce, although creamy and fragrant were not what I'm used back in Singapore and Malaysia. We tend to have a richer spicy sauce enriched with shrimp paste (belacan) and lots of peanuts and chilies. Then came the surprise discovery......the infamous Lucky Chip was in the house! I have been wanting to try their burger for ages but somehow never quite managed to pop down to Sebridge Arms, where they are based for their offerings. So the next sensible thing to do was to have a go. After scrutinising the menu, I parted with £7 and went for the Kevin Bacon (aged beef patty burger with applewood smoked bacon). Then the waiting game began. They were very popular and there appeared to be a long back log of orders. 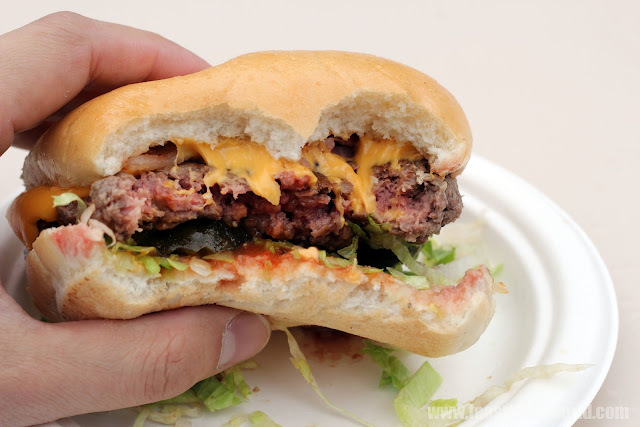 After a good 15 minutes or so, a plate of shiny buns filled with oozy cheese and meat patty appeared be fore my eyes. Without hesitation, I took a large bite into the beast and what a tasty mouthful that was. 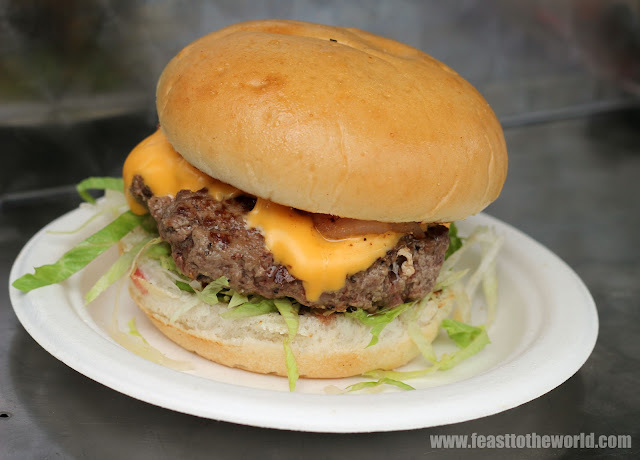 Packed full of beefy flavours, and perfectly cook - medium rare with bloody juices - it was a top notch quality burger. Sweet from the bacon and well seasoned patties with no greasy aftertaste. Very good indeed! I would have gone for another one had it not been for the supperclub that I was going to later in the evening. But rest assured, I will be back for more of those. Then the lunchtime pudding came in the form of a very imaginative Cucumber, lime and chili ice lolly by Icy Freshpops. Fresh, zingy and definitely has a very spicy kick to it. Sounds bizarre but was absolutely delicious. Everything on the menu were just as unusual and from what I gather, everything were made with fresh fruits. The whole visit ended with me getting more food from the lovely Kamchi guys - Katsu curry and gyoza - to take home with me. Netil market might be young but is definitely well worth a visit and I am planning to go back on a sunny day to wander around their quirky stalls and smile more delicious food. During my stay, I also managed to have a chat with Sarah (of Netil Market) who is immensely passionate about this market and its future. She has big plans and is eager to turn it into a even better weekend destination and from what I can see, she is getting there. 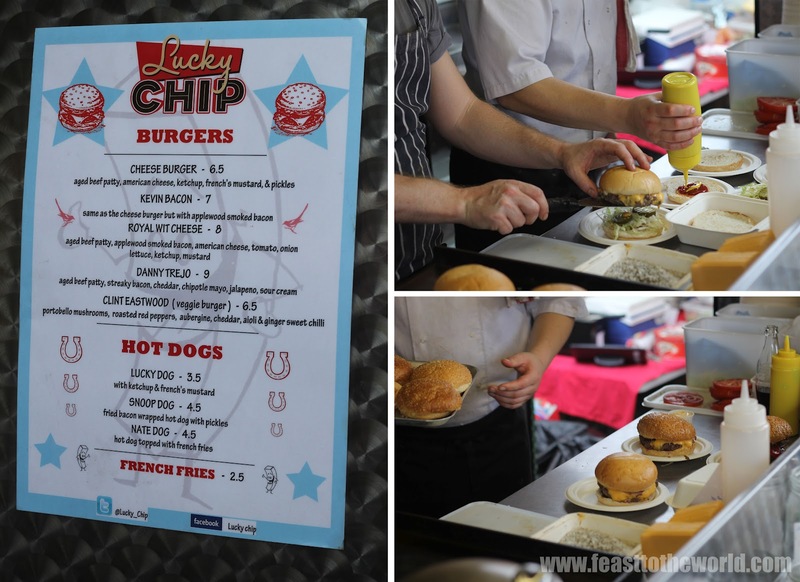 I haven't made it to Netil Market yet, but I've long been a fan of Lucky Chip burgers having visited them at The Sebright Arms often. Those ice pops sound awesome.